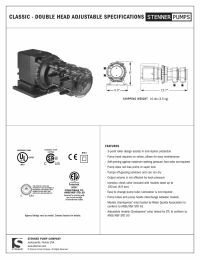 The Stenner 170JL1A1S is a double head adjustable peristaltic pump. This Classic Series pump has a single adjustable head that features an external adjustable dial ring on the feed rate control and is able to pump up to 170 gallons per day (GPD). This versatile pump can withstand pressures from 0 to 25 PSI. The Stenner 170JL1A1S is for light duty applications. The Stenner 170JL1A1S is designed for light duty applications both indoor and outdoor. 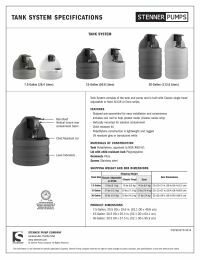 This pump is excellent for drinking water disinfection, livestock water, or many other applications. The Stenner 170JL1A1S is certified by WQA. The Stenner 170JL1A1S by WQA against NSF/ANSI Standard 61. The Stenner 170JL1A1S utilized for proportional dosing. The Stenner 170JL1A1S is a double head adjustable output pump that will work with 7.5, 15, and 30 gallon tanks.